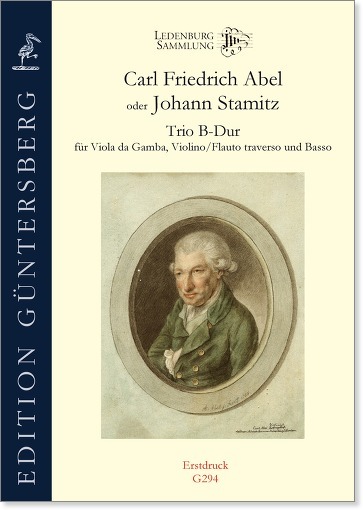 This three-movement trio by Carl Friedrich Abel or Johann Stamitz existed until now only in a version for flute, flute/violin, and bass. This work is only partially preserved in the Ledenburg Collection, with the first part having been transcribed an octave lower for viola da gamba. 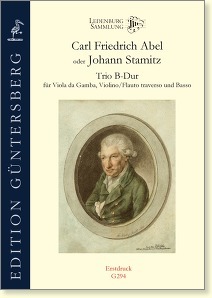 It is a welcome addition to the early Classic repertoire for trios with viola da gamba and flute/violin. The trio appears in print for the first time in this edition. The Ledenburg Collection in Osnabrück was discovered only in 2015. It primarily contains viol music from the time around 1750. The most important works in the collection are the twelve Fantasias for Viola da Gamba Solo by Georg Philipp Telemann, which were long thought to have been lost. The Works for Viola da Gamba in the Ledenburg Collection.